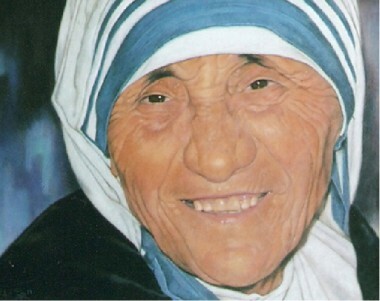 Saint Teresa of Calcutta – it has a nice ring to it, doesn’t it? Today, the Church officially canonizes she who was revered as the “Saint of the Gutters” during her lifetime. This world admires her for what it sees as her social work and humanitarianism and for her selfless charity. But, she could not do anything without the prayer, Eucharist, adoration and silent time with the Lord, which grounded her in her love for God. It was God who gave her the grace, the strength, the perseverance to do what He called her to do. Thus, as with all of us, she was nothing without God, a God who allowed her to feel that He was absent to her, in order that He might do more with her “yes” than someone who would have withheld that from Him. She spent decades of her life in what mystics call “the dark night”, a night more prolonged than the ordinary or traditional dark night we read so much about in spiritual theology explications. Through it all, her heart and soul burned with the fire of charity and she remained faithful to God’s call during her earthly sojourn. Mercy — Teresa of Calcutta was constantly moved with mercy and compassion for the suffering, the less fortunate, the poorest of the poor, the hungry, disenfranchised, homeless, despondent, despairing, those who have no one to help them and/or pray for them, the unborn, disabled, elderly, and those snubbed, scorned and treated as garbage by others. She embraced them and their difficulties, no matter where she encountered them, in India and around the world. Empathy — She not only sympathized with the poor and suffering, she became one of them, just like Christ became one of us. Because she adopted the strictest poverty, she was able to empathize with them and their plight and was better able to help them and serve them. Since we’re not God, it’s only when we go the extra mile with someone (cf Matthew 5:41) that we are really able to relate to them. It’s what Jesus did for us. It’s what Mother Teresa did for others. She respected everyone including, especially, the marginalized. Just as Christ never forced himself on others, she did not force herself either, though she could be very firm with people. This respect “saw” the Lord in each person, even in his distressing disguises. Teresa called it “The Gospel on Five Fingers.” Holding up one finger at a time she reminded people of what Jesus said: “You did it to Me” (cf Matthew 25:40). She respected and honored our Blessed Mother Mary. She respected and obeyed the Magisterium of the Church, just like all saints do. When she received her call within a call to found her religious order, she wasn’t even sure it was God who spoke to her, but submitted everything to the Church for discernment. She respected and obeyed her spiritual directors. Charity — Of course, charity, the agape love of God and neighbor, was foundational for the Missionaries of Charity, which she established. The Lord asked her to bring His Light to the poor because they were shunned and that Light wasn’t reaching them. How could anyone come to Him, if they had not had the Gospel preached to them (cf Romans 10:14-15)? Thus, it was the Light of God’s love that he wanted her to carry to others. And, Mother Teresa did, indeed, bring that Light to the forgotten by eloquently and humbly preaching the Gospel both in action and word by the ministry of her religious order, doing all with great love, even small things! Yes — Teresa of Calcutta said yes to whatever God asked of her. She did not think she would be able to carry out what he asked. But once she was certain it was God’s will, she did so freely and generously. We could all take a lesson from her here. Hopefully, the MERCY acronym will help all of us remember to put the simple and humble wisdom of St. Teresa of Calcutta into practice in our lives. Naturally, we are interested in Mother Teresa’s dark night because the dark night is a step on the way to union with God and, also, a subject of spiritual direction. Father Brian Kolodiejchuk, an MC (Missionaries of Charity) priest and postulator of her cause for sainthood, recently completed the short video interview (below) on her unusually extended dark night. The Catholic News Service produced it and graciously gave us permission to make use of it on our site. We trust it will give you some additional insight into this special and mysterious night, which lasted many, many years, and some additional insight into this very special saint for our times. Let us celebrate, with the Church, the canonization of this great saint of mercy today. Art: Modified detail of Mother Teresa, Evert Odekerken, 1988, CCA 2.5 Generic; Mother Teresa of Calcuta portrait painting, Robert Pérez Palou, 1 January 1994, CCA 3.0 Unported; both Wikimedia Commons. Video produced by the Catholic News Service and used with their permission.